I’m back with this Slow Cooker Korean Pork Bulgogi with Gochujang that’s a cross between Bulgogi and something that I ate recently at our favourite local Korean restaurant. And it’s the best way to break into cooking mode after an amazing holiday when you secretly don’t feel like cooking but know you have to. I got back from Raipur two days ago and kept wanting to write this post because this is the first thing I made for us – a big batch of slow cooked Korean pork bulgogi to tide us over the next two days till I could get back into cooking mode. I have had the most amazing trip with mum feeding us truckloads every day. On days when she didn’t, we made sure to overeat at our favourite haunts in Raipur, and explore the new ones. That’s the best part about going home right? It’s almost better than a holiday! I have to tell you guys that we’ve been making this slow cooker Korean pork bulgogi for a loooong time now, before winter set in and before we needed reasons not to do any proper cooking. 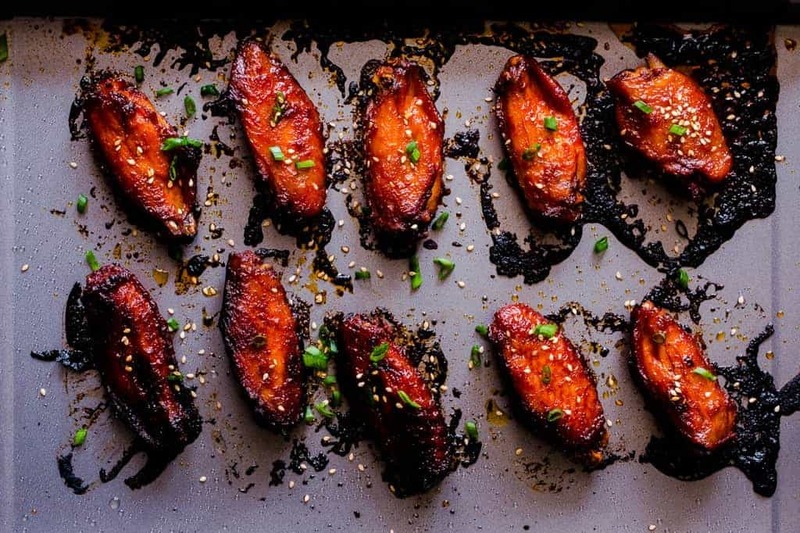 Because A) we are in love with our slow cooker and basically don’t need reasons to cook in it B) we discovered how much we love spicy Korean food like these Korean Chicken Wings and C) Denver’s Mangalorean connection means pork is a regular feature in our house. I know how some of you won’t have a slow cooker at home, so I have a stovetop version of this recipe too, but if you do own a crockpot or slow cooker and have it stashed in the deep, dark places of your home, it’s time to break it out! Because there is no other way to cook meat into fork tender pieces where it just breaks apart and melts in your mouth. Slow cooked pork just has so much flavour and depth that the stove top version really has to fight for. This may not be a super authentic Korean pork bulgogi but that’s okay. Because we always like to adapt and adjust recipes to our liking and there is nothing wrong with that. 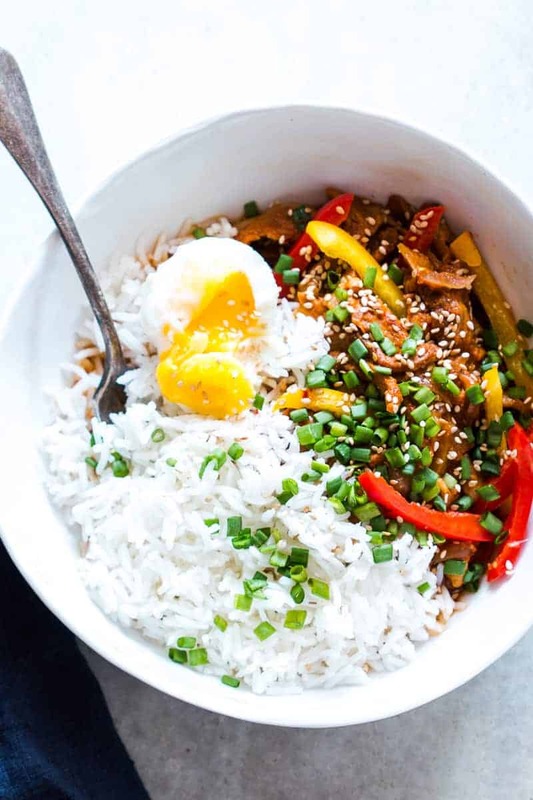 For example, I love adding tons of peppers to this dish – red, green and yellow right towards the end for some extra crunch, colour and flavour. They add a nice sweetness to the recipe without turning into mush. If you are not a big pork fan, feel free to swap it for beef, or even chicken and you should still have fabulous results. We turned it into a bowl with some rice, a 6 minute egg, sesame seeds and lots of chopped green onions. It had just enough soupy gravy to coat the rice and all those toppings were so crunchy. I’m bowl-ed over he he ???? <– that’s me trying to be funny! 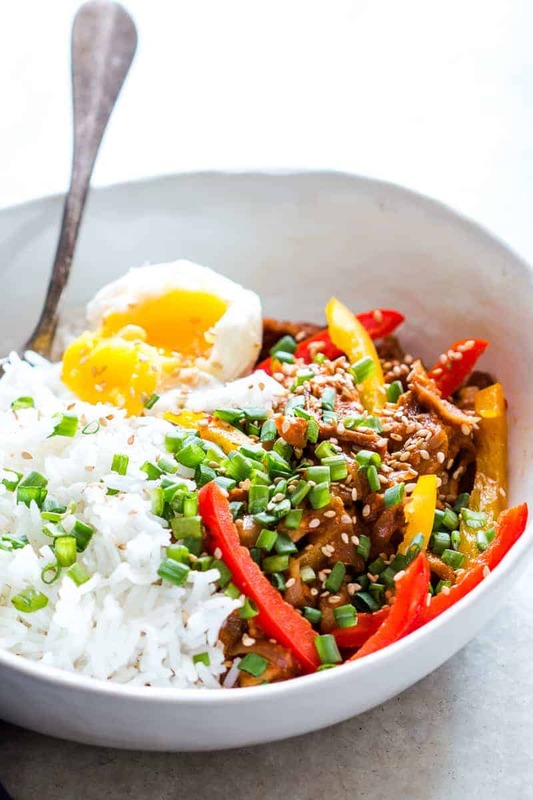 If you absolutely can’t get hold of Gochujang, the Korean hot sauce, for this recipe (which I highly recommend), go ahead and use Sriracha which adds a similar spicy kick! 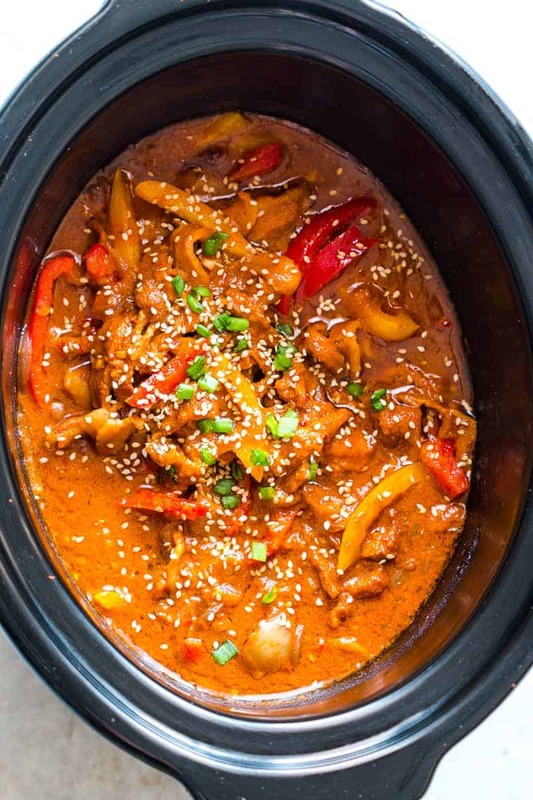 Easy Slow Cooker Korean Pork Bulgogi recipe that can be made in a crockpot and has spicy gochujang in it’s marinade. 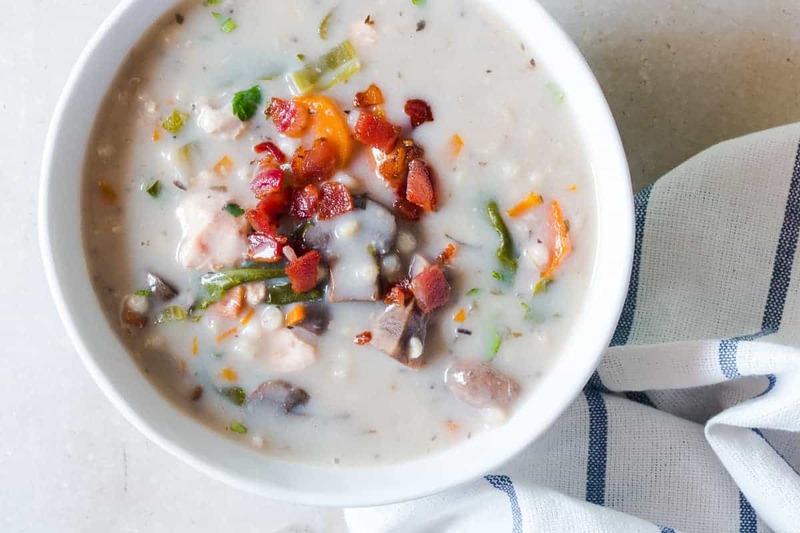 Healthy, yummy stew that’s perfect over rice for dinner! Marinade: To make the marinade, add apple, garlic, soy sauce, gochujang, chilli flakes and ginger to a food processor. Pulse till a smooth paste forms. Slow Cooker Recipe: In the slow cooker, add onions, pork, honey, salt and the marinade from the food processor. Cook on low for 7-8 hours or high for 3-4 hours. Once the pork is cooked through, skim the fat from the top of the pork and discard. Add the bell peppers and cook on high for 15-20 minutes. Top with sesame seeds and chopping spring onions. 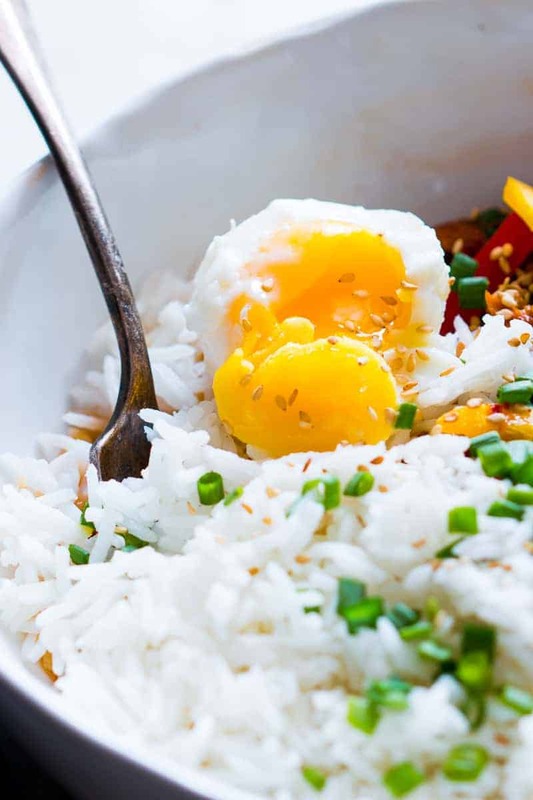 Serve over rice with a 6 minute egg. Stove Top Recipe: Marinate the pork in the paste for at least 2 hours or overnight. Heat 1 teaspoon vegetable oil (not mentioned in the recipe ingredients) in a wok and add onions. Stir fry on high for a minute or two and add the marinated pork with all the liquid. Cook on medium high heat for 10-15 minutes till the meat is cooked through and caramelized. Add bell peppers and stir-fry for another 2-3 minutes. Top with sesame seeds and chopping spring onions. 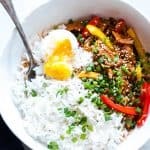 Serve over rice with a 6 minute egg. Making this with chicken breast in the slow cooker now since it’s what I had on hand…smells great! I am trying this recipe on a stove top. I will post comments after the fact. This looks amazing! What cut of pork do you use? Thanks Leslie! I used pork belly, but pork shoulder works well too. I hope you give this a try – it’s a favourite at home! In the stove cook method you have marinated the pork but not in the slow cooked method, is that right. Please clarify. Yes, that’s right Connie. Simply because the slow cooking process makes sure that the flavours really permeate the pork without marinating it. I hope you try this out!